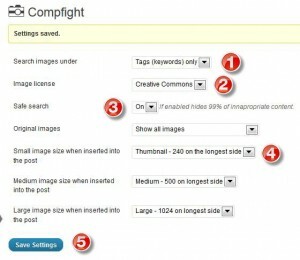 A plugin extends the way you can use your blog. It might be a form to add to posts, some extra widgets for the sidebar, an easy way to add images to posts – all these are done by activating a particular plugin. Here is a post to read about activating plugins and an overview of many available on your blog (instructions included). There are some plugins I would recommend you have for your blog. These are in alphabetical order but compfight is a necessity I feel. On your dashboard> plugins> hover under compfight and click on activate. Then click on settings and change to image below.